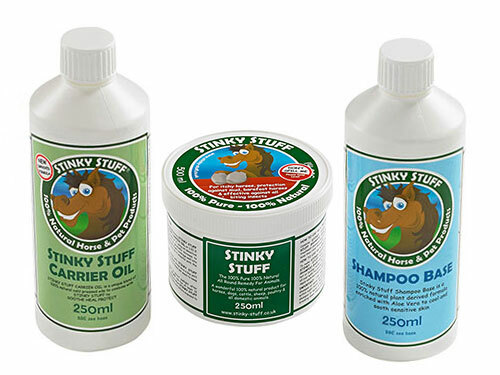 Original Stinky Stuff for horses is great at relieving your horses itchy, irritated skin, promoting hair regrowth, keeping away flies and nuisance insects, protecting against wet and muddy conditions and also contains natural anti-fungal and anti-bacterial properties. But don’t take our word for it – give it a try yourself! Our Horse Stinky Stuff Trial Pack gives you everything you need to try Stinky Stuff as a soothing massage rub to protect against wet and muddy conditions, shampoo to soothe irritated skin and a fly spray to repel nuisance insects. For instructions on how to use Original Stinky Stuff as a shampoo wash, a massage rub and fly repellent, please see our help guide. 250ml Original Stinky Stuff for horses. 250ml Carrier Oil for horses. 250ml Shampoo Base for horses.